Have you checked out my guest post on Healthy Living Blogs? It’s about the one fitness tool I can’t live without. I wonder if any of you can guess what it is before you read…? 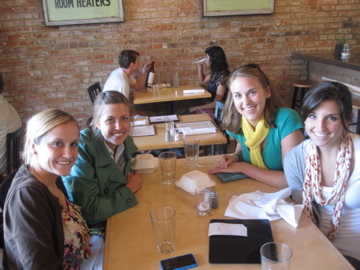 Tonight LB invited me to a celebratory dinner with the other girls that ran races this past weekend. Jackie, LB, and I all ran the marathon while Anna had to drop back to the half due to a knee injury, but still rocked it! 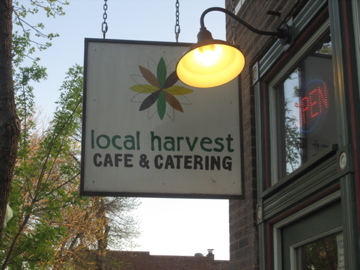 LB had a Groupon for Local Harvest Cafe, a restaurant that uses sources all of its food from local farmers and has a changing seasonal menu. I’ve wanted to try it ever since I took a vegan cooking class with its head chef, Clara Moore. Tons of items on the menu looked delicious, included spinach lasagna, and a Mediterranean sandwich on bread from a local bakery. I would have loved to try the vegan enchiladas, but I pretty much had those for lunch today. Instead I went with a cup their well-reviewed vegan chili and the “Green Plate” special. The chili was just lightly spicy and full of black beans, pinto beans, and chickpeas. I’d never had a chili with chickpeas in it before and I really enjoyed them. 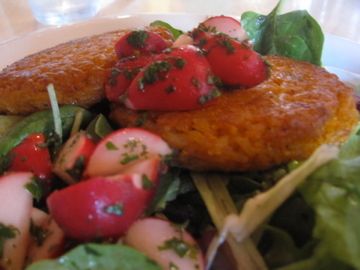 The “Green Plate” special was a salad with local radishes topped with sweet potato rice cakes. I loved the crunch of the radish against the soft sweet potato cake. They were primarily rice held together with the mashed sweet potato. Loved them and purposely saved one for lunch tomorrow. I think if I lived closer to Local Harvest I would eat there very often. The brunch menu looked amazing (vegan stuffed french toast!) and they had a mango mimosa that sounded pretty incredible. There is also a Local Harvest Grocery across the street where you can purchase the local ingredients the restaurant uses! I’m totally on board with any place that supports the locavore movement. I was very tempted to hit up Ben and Jerry’s for a free ice cream cone today, but the closest location was pretty far away. Instead I came home and kept snacking on quinoa crackers, a plain whole wheat wrap, and a grapefruit. I’m kind of sad that I missed the first episode of Jamie Oliver’s Food Revolution but I’m sure I can find it on repeat later this week. Hope you had a great day! Do you have a favorite restaurant nearby that supports local farmers? 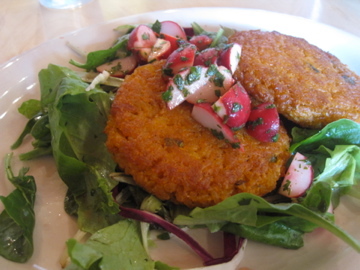 I recently ate at Vine and Sprig in New Hope…pure vegetarian. It was amazing! These photos are making me so hungry!!!! There’s a new restaurant in Dallas called Company Cafe, and they are all about local and organic ingredients. We ate there last week and loved it! AND I read your guest post, loved it! I’m with Kimberley!! I love Groupons too!!!!!!!!!!! we dont have any around here 😦 lookslike ill just be living vicariously through you! I feel like pretty much every non-chain restaurant in Charlottesville puts an emphasis on using local, organic food. Moving to this town two years ago for grad school really changed my way of thinking, eating, and fueling my body. On a different note, I just started The China Study and I’m wondering what you think of protein powders that contain egg whites, such as Jay Robb? This book is really fascinating!! I wanted to hit up B and Js too…but there isn’t one in my city! There isn’t even one back home haha. All we have are fro-yo places around here! AHH that food looks delicious! i wish i had or knew of a restaurant near me like that! Oh I totally forgot Jamie Oliver’s show was last night! I’ll have to find it online too. I loved watching it last season! We don’t have many restaurants like that where I go to school and I can’t think of any in Memphis. In Nashville there are definitely some good ones! That looks incredible! I have a great restaurant by my house that is fairly local, and there was tons of local food in Ottawa this past weekend! Orlando is really great about supporting local foods. 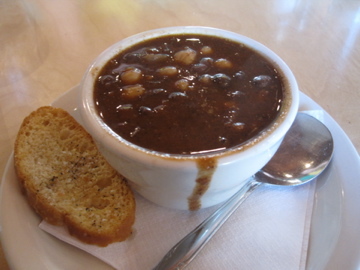 Actually, I just tried the vegan chili at a place called Dandelion that does just that! Unfortunately I dont think my dish was as good as yours. Ah well, I’ll just have to try the other goodies on their menu. that sweet potato cake look wonderful! I love cute little restaurants that support local farmers but sadly I have yet to find any in my area..